Britain’s youngest ever World Boxing Champion, Amir enraged over his ring rival Phil Lo Greco’s personal comments. He threw water over him midst of a press conference. The Canadian boxer made some personal remarks on Khan about his family issues and marital difficulties due to which British welterweight Khan lost his cool and reacted in such a way. The English light-welterweight champion Amir Khan is returning to the arena after two years and is supposed to meet Le Greco in a match at Liverpool’s Echo Arena on 21st April. 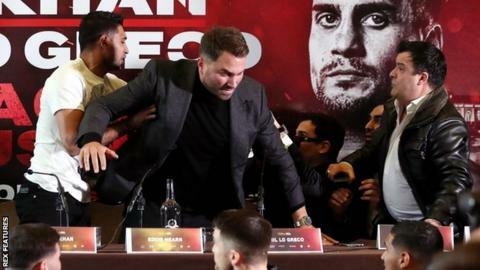 The press conference was conducted as a part of the pre-fight promotional event, the WBC International Welterweight Champion, Phil Le Greco’s cheap shot against Khan backfired and he received an unwelcoming water splash on his face. The statement of the Canadian boxer which called for an on-stage fight was about Khan’s personal issues which started after he lost to Saul Canelo Alvarez in May 2016. Lo Greco words “then you go out and tweet to the heavyweight champion of the world” was in reference to a tweet sent by Khan to unified world heavyweight champion, Anthony Joshua in August last year. The tweet was concerning Amir’s allegations to Joshua that he is dating Amir Khan’s ex-wife Faryal. Khan later apologized to the British heavyweight for it. What Happened after the Water fight? The security calmed the on-stage fire and the promoter of the event asked Lo Greco to apologize for his statement. Khan, on the other hand, was furious about his personal comments and is planning to use it as a motivation to “give this guy a beating”. He even refused to apologize to Lo Greco for throwing water but said sorry to those in attendance.